There is an addition of 13 professions and the prominent among them are Interactive Media Developers and professionals in Computer Programming in the Demand Occupations List of Saskatchewan. It also requires Work experience in an occupation, appearing on the list for the top Demand Occupation and in Express Entry sub-categories of SINP. It does not require a job offer, for these sub-categories. The SINP allows provinces/territories participating in the programs, in nominating specific candidates, for immigration to attain the Canada PR. Additionally, the successful Express Entry Candidates, who obtain the nomination in the SINP Express Entry sub-category of the province, also get 600 more points in the rank score. It also serves as a guarantee to get the ITA to take up permanent residency in the country. Candidates not present in the Express Entry pool can also seek the SINP nomination, through the Occupation In-Demand category. 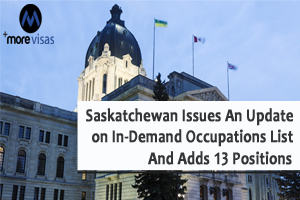 The Express Entry and Occupation top Demand sub-categories use the Demand Occupations List as eligibility criteria. There are 24 new occupations among the revised list, updated on April 4. Nine occupations were removed in the update. Of these nine require specific educational requirements and do not require professional status or licenses. The authorities in Saskatchewan revise Demand Occupations List periodically. There can be a revision again in the future, and the candidates have to submit the EOI to the Program urgently. We bring the details and you can contact us for guidance and additional matter.